From The Foodscape Revolution by Brie Arthur: ‘Limelight’ hydrangeas makes a good backdrop for a basil edge. Nashville Lawn and Garden Show, which was the first weekend in March. 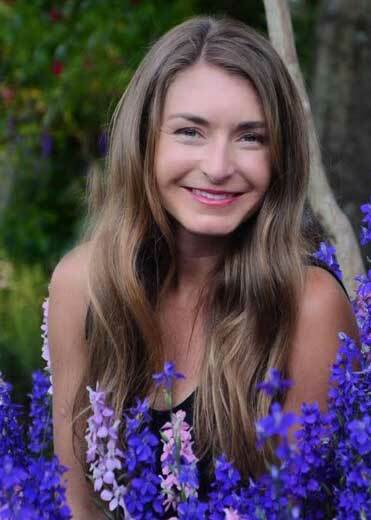 Her book, and her gardening passion, is about making space in your landscape for food, growing it alongside the trees, shrubs and ornamental plantings that can make up a tidy landscape, even if you live in a neighborhood under the rules of a persnickety homeowners’ association. The story in the paper turned out to be more about the show than about how to beautifully flout the HOA’s rules, but Brie and I had talked for much longer, as gardeners are inclined to do, about the benefits and the joy of growing food and flowers. Since many of her ideas weren’t included in the story about last weekend’s garden show, I’m happy I can share them here. Onions and garlic make good edge plants, and offer the added benefit of keeping rabbits, moles and voles out of landscape beds (they don’t like the odor). Sweet potato vines are often used as decorative plants, and sweet potato foliage provides an effective groundcover while the sweet, fleshy tubers are growing under the soil. Brie likes the idea of growing arugula alongside the flowers. “You can let that flower and it’s beautiful. It attracts pollinators, and rabbits don’t like the bitter flavor,” she said. Plants in the nightshade family can be lovely and deter browsing visitors of all types. These solaneceous plants include peppers, potatoes, eggplant, tomatoes and more, and can be highly ornamental. Brie especially favors a variety of dwarf pepper called ‘Mad Hatter,’ a sweet-tasting All-America Selection winner that produces an abundance of peppers that, she said, are great for pickling. 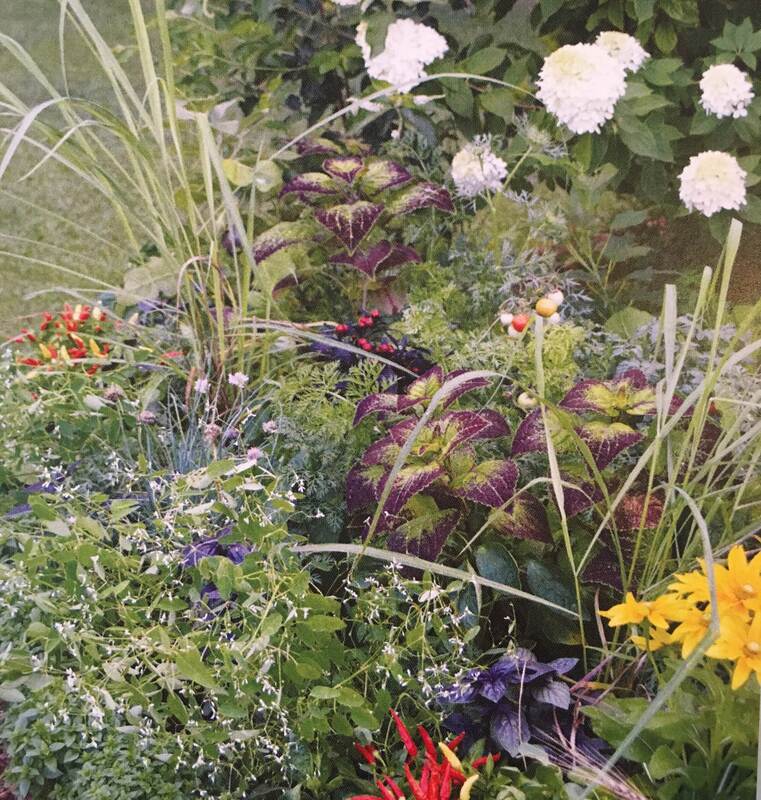 And she favors herbs of all types, which can add soft or shrubby textures to the bed. One of the challenges in a landscape of flowers and food may be irrigation, especially if there are trees competing for the available moisture in the soil. “Trees soak up every single drop of water,” so supplemental irrigation is a must. Planting in “zones” in the landscape makes this easier. In Zone 1, close to the house where it’s easier to monitor the water situation, is the place to grow plants that require consistent water. Zone 2, a little farther out, should be the place for plants that need less irrigation, and crops that don’t need much water once they are established should grow in Zone 3, away from the house. Ultimately, Brie said, the idea is to simplify the process of growing food. She gardens around her home in the southernmost suburb of Raleigh, NC, in hardiness zone 7a-7b. “The number one thing when growing food is, write down what you eat on a regular basis and try to grow some of that. Number two, don’t overplant. Don’t put yourself in a position where you feel stress. This is a hobby that brings you joy and you should never feel like it’s work. And number three, encourage everyone around you to help. I’ve recruited neighborhood kids, and they do all the hard labor,” she laughed. 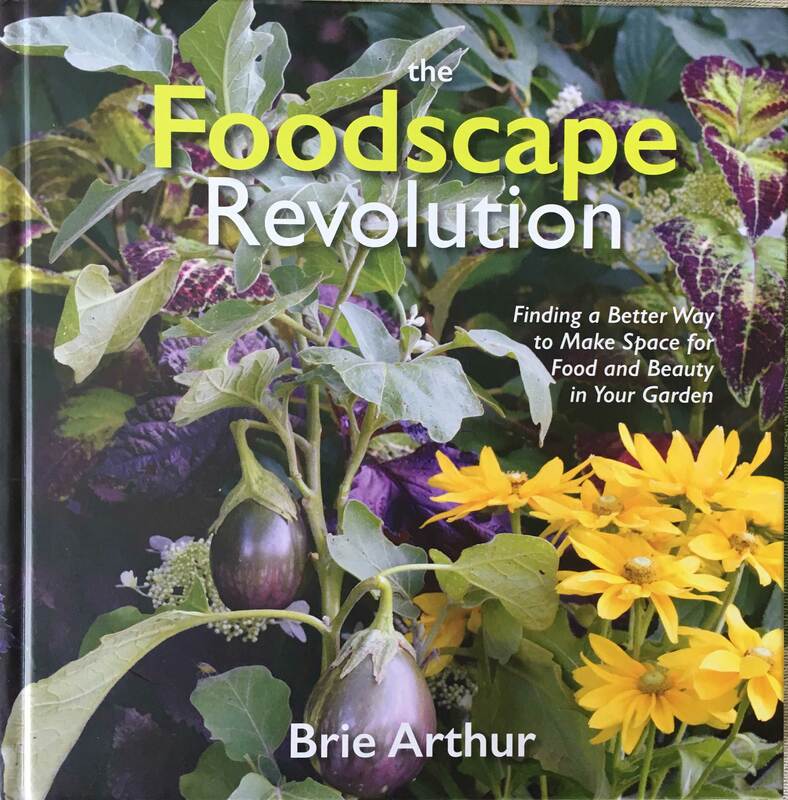 I met Brie in person at the Nashville Lawn and Garden Show and bought a copy of The Foodscape Revolution. It’s full of good ideas and planting suggestions both ornamental and edible, and includes a few recipes as a bonus. “I want people to see the power of the square footage in the land surrounding their house,” she said.